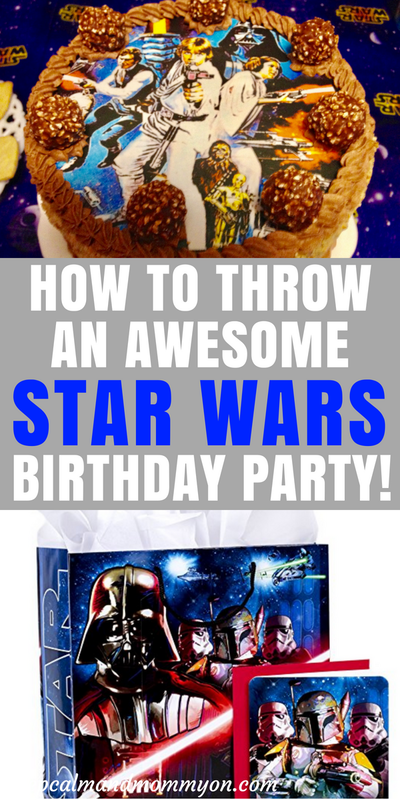 How To Throw An Awesome Star Wars Birthday Party! Are you looking for fun and creative Star Wars birthday party ideas? These Star Wars birthday party ideas will help you to throw the ultimate birthday party! So I started brainstorming and searching for some of the best star wars birthday ideas that I could find! These are all star wars birthday party ideas that are sure to make your star wars party the most awesome party ever! 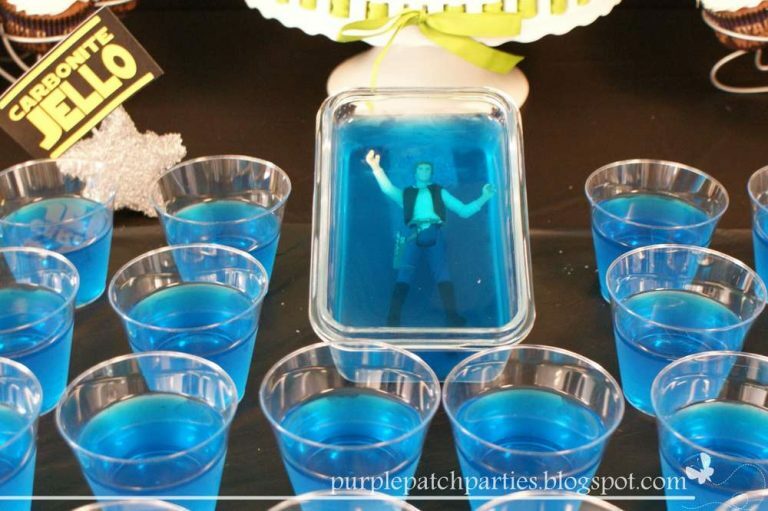 There are so many different possibilities when it comes to Star Wars Birthday Party Ideas! Invitations are the place to start! Choose your favorite invitations and send them out in advance to all of your potential party guests. Here are several options that you can choose from. Some invitations also include thank you notes which I think is nice. Thank you notes are a great way to teach your kids to thank their guests for their presents! Next you need to gather your Star Wars birthday party supplies! Here are four different star wars paper plates and cups to choose from. We used the last set of paper plates and cups listed here along with this Star Wars tablecloth. After you have your plates, cups, napkins etc., you can add some decorations if you would like. These are some fun options! Kids always love balloons, so I always make sure that I have balloons that fit their theme! I buy them online and then take them to the grocery store five minutes from my house and have them fill them up with helium. For the Star Wars birthday I also purchased a tall Princess Leia cardboard cutout just like the Luke Skywalker one pictured below. My daughter loved it! Birthday banners are also a great party decoration. This Star Wars Birthday Banner is a great one to use! This is a picture of the cake that I made my daughter for her Star Wars birthday party. I usually do fondant cakes or tiered theme cakes like this Dinosaur Birthday Cake and this Frozen Birthday Cake, but this year my daughter had a specific cake flavor that she wanted. She asked me for this incredibly delicious Chocolate Nutella Cheesecake Cake from Wicked Good Kitchen! I was thrilled with this request;) It is the most delicious cake I have ever had and my own personal favorite! So I knew what kind of cake I was going to make, but I needed to figure out a way to make it a Star Wars birthday cake. I couldn’t very well make a tiered cake out of it ( I’m not messing with this amazing recipe, its perfect just the way it is! ;), and I definitely wasn’t going to cover it in fondant! So, I found this super cool Star Wars edible image! It’s an 8 inch circle that fits perfectly on the top of this cake! And the awesome part is that it is incredibly easy to apply, giving you a professional looking cake with very little effort! You can use this edible image on any cake that you would like. It comes with application instructions and once applied it looks like it is part of the icing. Super cool! on our Star Wars birthday cake. 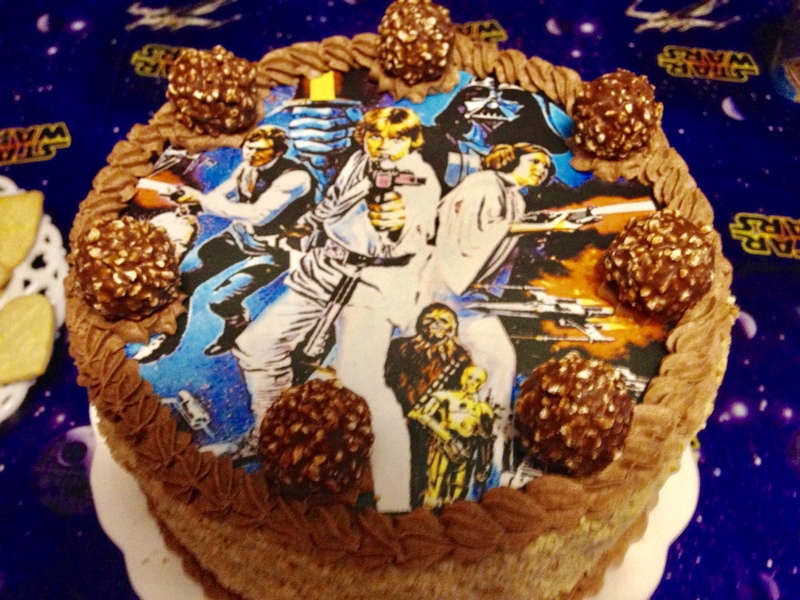 Don’t forget fun Star Wars food for your birthday party! There are lots of fun ideas to choose from when it comes to food! We decided to keep ours simple and just do snacks instead of a full meal. One of my favorite is Princess Lays! This is a super cute idea and incredibly easy to do! I mean, how hard is it to dump a bag of chips into a bowl?! You can find this cute idea from Catch My Party. To make the sign I simply folded a piece of black cardstock and wrote on it using gold puffy paint. I made signs for all of my food items using this. This is another Star Wars food item that I made for our party. A super cute idea and another easy to make snack! Plus, this is a healthy snack. I always like to include at least one food item at the party that isn’t full of sugar and that is actually nutritious! I found this idea at Rookie Moms. The nice thing about them is that they are made using items that you probably already have on hand. How cute are these storm trooper cupcakes?! 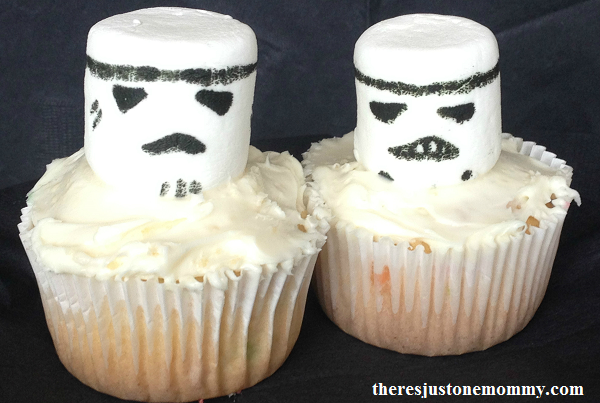 I found this fun and easy to make Star Wars food idea at There’s Just One Mommy. Whenever I make a birthday cake and have a little extra batter left over after filling my cake pans, I use it to make a few cupcakes. I then sit the cupcakes on a platter near the cake. This is a great idea to use when decorating those extra cupcakes! This is another item that I didn’t include at our party that I wish I would have! How cool is this?! And so creative! In Star Wars the Empire Strikes Back, Hans Solo was frozen in carbonite. This fun star wars food is a recreation of that. 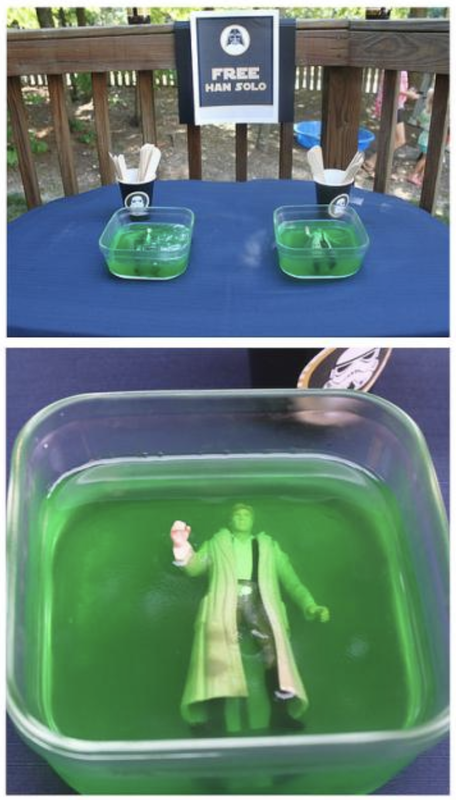 Freeze Captain Solo in jello! This super neat idea comes from Catch My Party. 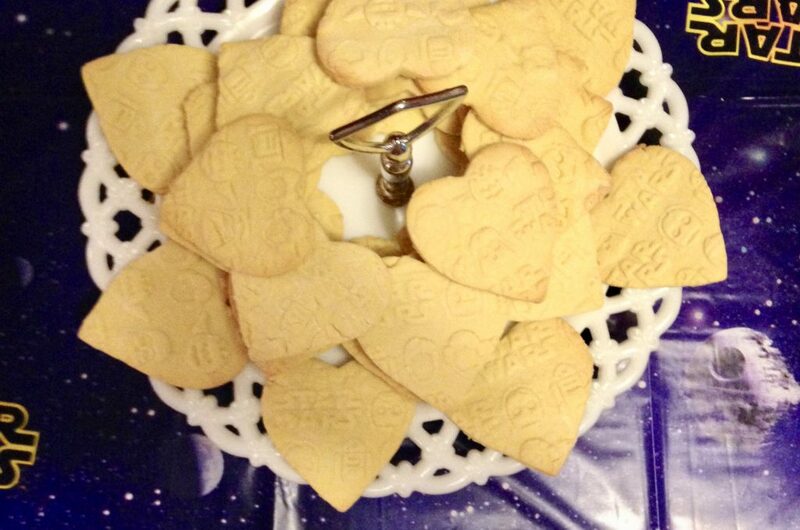 Another great Star Wars food item to include at a birthday party is cookies! Here are four great Star Wars cookie cutter options. These are the cookies that I made for our birthday party. I did not just use a cookie cutter for my cookies. I also used this super neat Star Wars rolling pin! It also comes with a recipe that was really good. You simply make the dough, roll it out using a regular rolling pin, and then roll over it with the Star Wars rolling pin. This leaves Star Wars prints on your cookies. Then use a cookie cutter to cut them out. Here are two Star Wars rolling pin options that you can choose from. The first one is the one that I used and comes with the recipe that I used as well. Costumes are not required for a birthday party, but they make it a lot more fun! 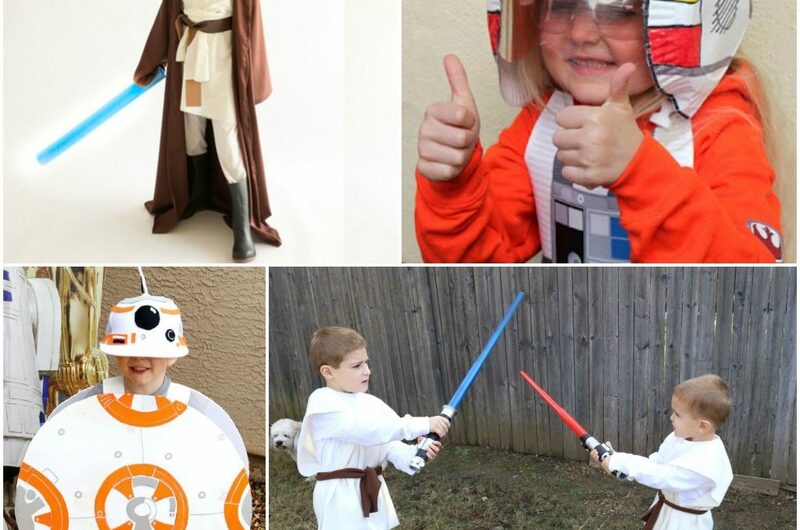 Here are some great Star Wars costumes for kids! If you would rather make your own Star Wars costumes then check out these fun and creative DIY Star Wars costumes from Frugal Fun 4 Boys. Party games are another great party idea! Here are some fun and creative DIY Star Wars birthday party games! This is a super cute idea! Kind of like pin the tail on the donkey, but instead of tail you use a yarn bun circle and pin it on princess Leia! You can find this idea at Rookie Moms. They also have options for boys using other items as well. This is another great Star Wars birthday party game! It’s the same thing that I mentioned above as a Star Wars food item. But instead of eating it, the kids are going to play in it! Be the first to free Hans Solo from carbonite and win! Find out exactly how to make and play this Star Wars game at Spaceships and Laser Beams. Corn hole is a fun game for any party! So why not make a Star Wars version?! 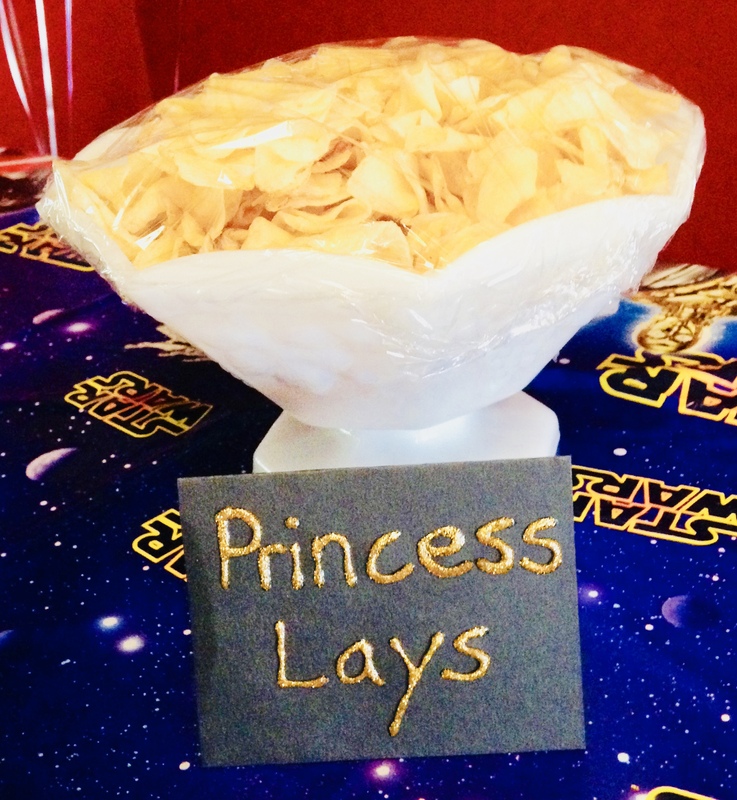 Find out exactly how to make this Star Wars birthday party game at Spaceships and Laser Beams. 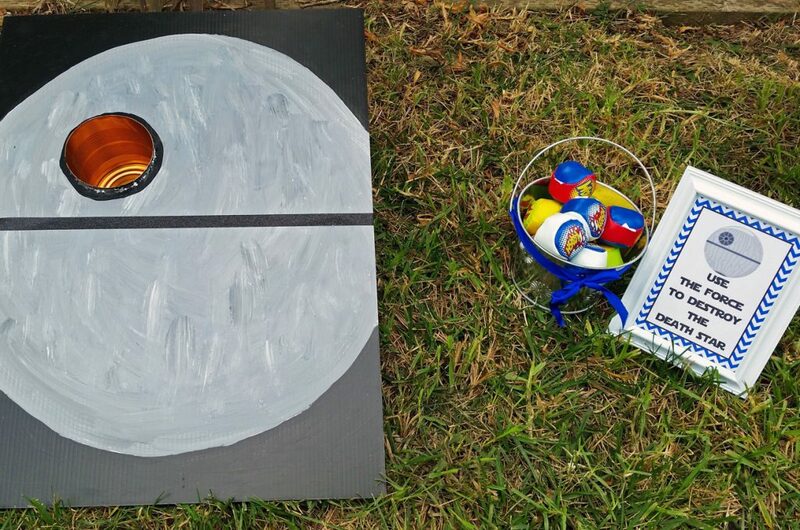 This is another great addition to an outdoors Star Wars birthday party. Don’t forget to include Star Wars party favors for each of your guests! Here are four fun and simple party favors that you can include in your party gift bags. And last but not least, don’t forget Star Wars gifts for the birthday boy or girl! There are lots of great Star Wars toys that you can choose from. Here are four great ideas to help you out! And that’s how to throw an awesome Star Wars birthday party! I hope you and your little Jedi have a great birthday and enjoy the birthday items listed in this post! Wishing you a great big Star Wars Happy Birthday! « 10 Minecraft Perler Beads!